The model represents a former 18th century sheepfold near Honfleur, Normandy (France), which was later converted into a dwelling house. It is a fine example of a timber framed building typical of the Pays d’Auge region in Normandy. It was refurbished and partly enlarged in 2000, being not theme for our current inspection. This building demonstrates several stages of evolution: on the East elevation there are vertical studs and inside bracing; on the South-facing side there are oblique studs while in the front elevation double bracing has been used. In the 19th century more complex methods were introduced on the building like the St Andrew’s Cross or the ‘Épi et Fougéres”, which had much stronger bracing effect. As well as improving the building structurally, they were also more interesting aesthetically. Most of the studs were left loose without use of wooden pegs. 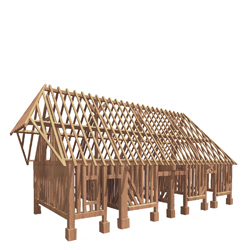 The timber frame materials originally came from local woods or from hedgerows (bocage). The walls between the timber frame had wattle and daub infill, while the roof was possibly thatched with straw in the beginning. The curved main rafters are made from either elm or oak. Their specific shape actualy follows the grain direction of the growing tree. They are essential components to stabilise the plate and provide a strong bracing impact. Please check the technical requirements for the Unity environment on the Main Page.